The special PU coating makes Enterprise NV athermic and its formulation is not attacked by microbacteria. Enterprise NV can be cleaned using a simple solution of water and natural detergents. More resistant stains can be removed using an alcohol based solution. Enterprise NV is without doubt one of the easiest materials to maintain, in terms of washability. Enterprise NV is unbeatable for its resistance to the effects of seating; its elasticity gives the stitching a longer life than the seams on vinyl coated textiles or equally soft leather. Regardless of the softness and comfort which characterizes it, Enterprise NV can, in no uncertain terms, be classified as suitable for use on furnishing with a high passage of people; in fact its abrasion resistance has no equal. Compared with other materials with the same mechanical characteristics, Enterprise NV is particularly light. Enterprise NV weighs at least half that of real leather with the same characteristics. Enterprise NV guarantees a much lower amount of waste, unlike natural leather where the efficiency of nesting depends on the regularity of the skin and so waste can easily arrive at up to 40%. Upon request Enterprise NV can be supplied in B1 Fire Retardant Class. 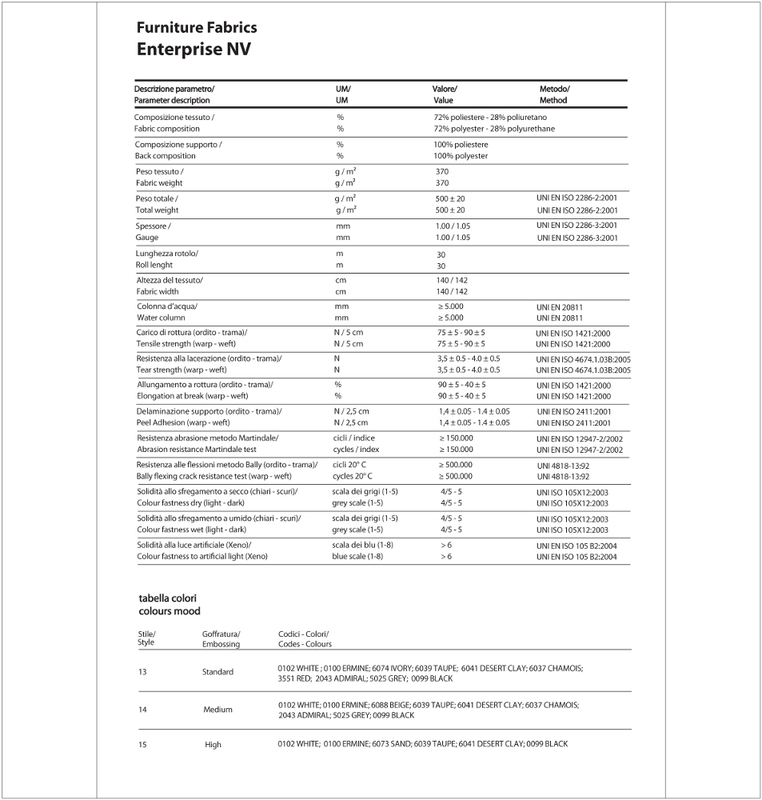 Enterprise NV has no plasticizers, heavy metals or stabilizers and does not undergo any of the treatments needed for natural leather or vinyl - both of which use highly polluting substance. Enterprise NV can be supplied in three different finishings, more or less pronounced according to the taste and need of the final customer. Enterprise NV is particularly suitable for panelings, ceilings and for the upholstery of smooth or curved surfaces. The thickness and the softness of the back of the fabric, which is 100% polyester, gives a particular feature of compactness to the panels which, differently, it is possible to achieve unless by the coupling with jersey or foam. Dab or wipe stains immediately before they penetrate the material. For stubborn stains, use mild solvent. Disinfect with a 5:1 bleach solution (non-chlorinated bleach only). For tougher stains use specific specific cleaners of our formulation or alternatively alcohol-based cleaners.